London designer Michael Anastassiades has created a range of lamps using tubular bulbs and brass rods arranged in various configurations. Created for Milan-based Nilufar Gallery, the One Well-Known Sequence range features 11 linear lights that pair handmade brass fittings with LED bulbs. Each of the lights come in different configurations, chosen by Anastassiades for their "apparent effortlessness" and are crafted by a UK machinist. The bulbs and the brass rods are of the same diameter, and have been arranged to appear as "parallel repetitions" of one another. While some lights hang on perpendicular cords, others are floor standing and sit on circular bases that house a central brass stem, or rest as horizontal rods stacked on top of one another. Bulbs are either one metre or 0.5 metres long, and are arranged singly, in pairs, or in trios, alongside the brass fixtures. "When setting out on a new design, the intentions are never obvious," said Anastassiades, who previously designed lamps strung on fine cables for Italian lighting brand Flos. "But subconsciously, you end up creating something where everything appears to be there for a reason. The proposed designs are definitely time and site specific," he added. 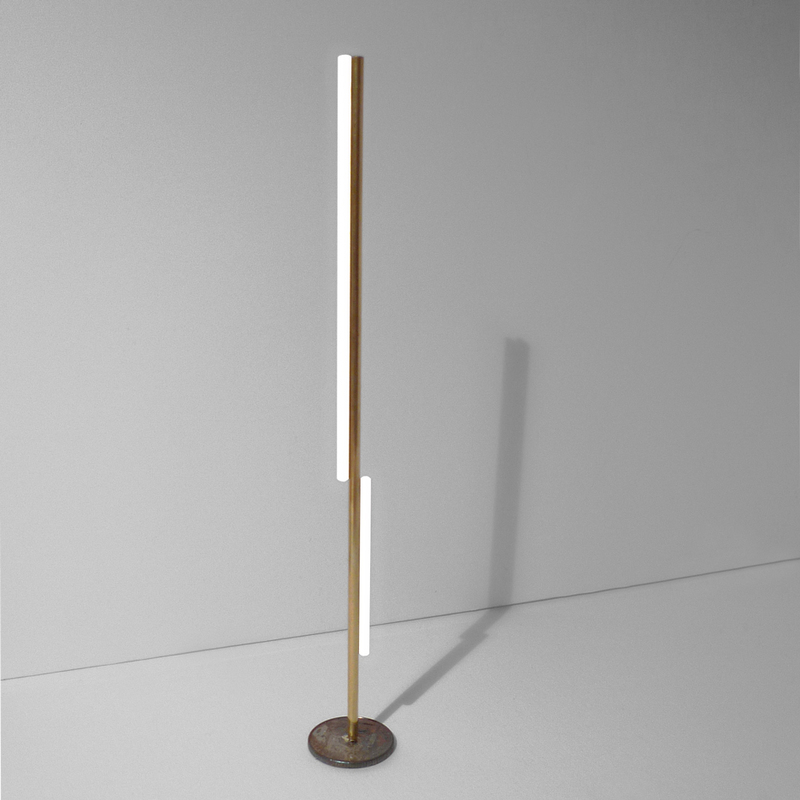 One Well-Known Sequence is Michael Anastassiades' third lighting collection for Nilufar Gallery, and is being exhibited in a former Camden garage from 12 to 17 October 2015. Anastassiades is set to convert the space into his studio over the next few months. Over 100 years old, the painted-red concrete floor and blue walls from the space's previous use as a garage have been purposefully left intact. "I have spent over a year looking at possible places to move the studio to," the designer told Dezeen. "During that time I have seen more than 20 and it only took a few minutes to decide that they were not suitable. I guess it is a feeling you get once you experience the right space. It's instant." The designer's minimal aesthetic is evident throughout his lighting collections, for which he has become best-known. These include the Mobile Chandelier series of illuminated globes held on delicate U-shaped metal supports and the Tip of the Tongue spherical lamp that looks like it is about to tip off the edge of its base. Anastassiades launched his first furniture piece – an equally pared-back two-seater high-backed sofa – at this year's London Design Festival.